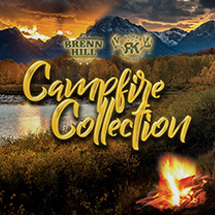 Defenders Recording Co and The R&K Hunting Company present The R&K Campfire Collection, the latest recording by artist Brenn Hill. Featuring “Campfire” mixes of some of Brenn’s most beloved recordings and two new songs inspired by his time at the Broadbent Ranch. “My Time To Kill” is a song for and about the western hunting adventure and dedicated to those who live to hunt. “Feed My Sheep” is a musical tribute to the late Joe Broadbent with a call to the Heavens for help for “one who’s gone astray”. In this haunting dedication, we learn that heaven is an Aspen Meadow in a Wyoming sunrise. Other time-tested favorites like “Monster On Your Back” and “Meet Me In McCall” feature new vocal performances by Brenn in scaled down instrumentation. Thanks to cowriters Jared Rogerson (www.jaredrogerson.com) and Nate Curry, this song is a tribute to all of those who long for a high mountain or high desert hunting adventure. It is the capstone recording of my ‘hunting’ record, The R&K Campfire Collection. Special thanks to Jared, Nate, and R&K. And very special thanks to all of those I have hunted with over the years. See you on the mountain. My life was forever changed for the better the day I met Joe Broadbent. I was on a Broadbent horse, on the Broadbent ranch, beneath a beautiful golden aspen grove when he drove out a rutted two-track road to shake hands with me. I was the lone character in a Wyoming State Tourism video. They had licensed “Horseback Getaway” for a promotion back in 2006. It was my first and only music video production. In subsequent years I saw Joe and his wife at USU’s annual Sheep Banquet, became friends with them, and sang at Joe’s funeral in 2013 when he was tragically killed in Provo Canyon. Last Fall I finally had the privilege of hunting alongside legendary guide Dave Beronio on the Broadbent Ranch. Joe was with us.